Here is a promotion by Dr Web giving out free 1 year antivirus genuine license. Dr.Web Antivirus normally cost 21,84 EURO for 1 user valid for 1 year but it’s free for a limited time. If you wish to get your personalized genuine license for Dr.Web Antivirus v5 valid for one year, just follow the simple instructions below. Best part is this license can also be used on Dr.Web anti-virus for Windows Mobile. Get it FAST before this offer expires! Some of the impressive feature found in Dr.Web antivirus is FLY-CODE, which is a universal decompression technology that allows detecting viruses disguised by means of packers unknown to Dr.Web. Just like other top antivirus, Dr.Web also has a unique non-signature detection technology called Origins Tracing that has also been brought to a new level in Dr.Web 5.0. It has already proven its efficiency during epidemics that caused data losses to a large number of customers of other vendors. Other than that, it can detect spam-bots, scans virus in email, automatic updating and etc. 2. Click the button at the bottom to go to the next step. 3. Enter your name, valid email address, age and again click the red color button on the right. It is advisable to use Hotmail or Yahoo because Gmail seems to have problems. 4. You can enter anything in the box that has asterisk and click the button on the right. 5. Check the email that you entered in step 2 and you should get an email from public@drweb.com.cn with the subject containing Chinese characters. Note down the 16 digit product key. If you didn’t get any email, you should check your junk/spam folder. 6. Download the latest version of Dr.Web Antivirus v5 and install. 7. During installation, Dr.Web will ask for license key file. Select “Receive key file during installation” and click next. 8. On the registration step 1 window, click “Obtain a license key file”. At step 2, type in the 16 digit OEM serial number and click Next. Step 3 just click Next. Now provide your user information to register yourself as Dr.Web customer and click Next. Finally it will verify your serial number and generate a key file drweb32.key. 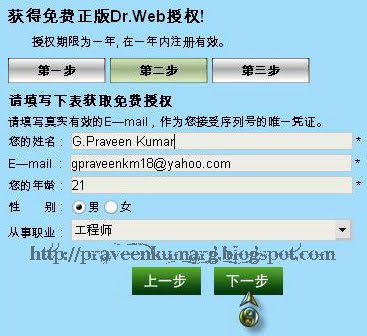 Alternatively you can also go to this page http://buy.drweb.com/register/ to generate your Dr.Web key file based on your serial number.